Teach your kids to make this awesome globe. Simple and effective, it is a fun, yet educational method of teaching children about world geography in a manner that will register firmly within their minds. Unlike political or geographic maps, this world map globe accurately represents the various parts of the world. This 8 inch globe can be used at schools, universities and offices, even at home for homework or decoration. 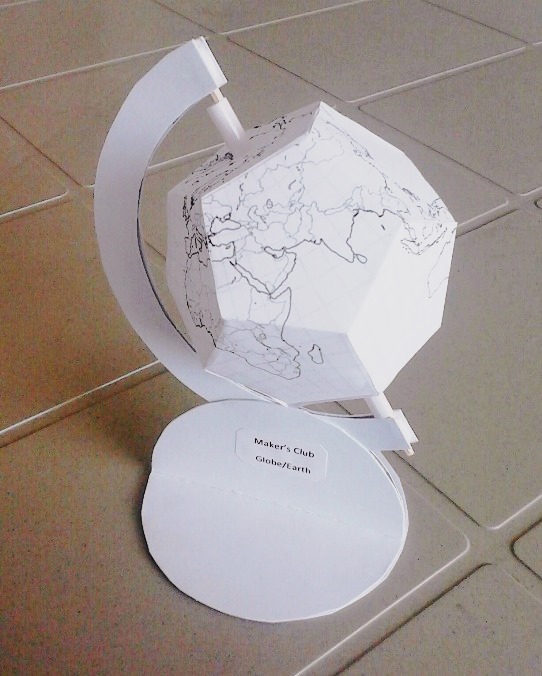 This Globe kit contains a printed ready to cut and glue earth, 2 half circle holders, 3 circles for the stand, skewer for the axis and straw for the spacers. Use this informative manual to create the globe. Teach children about the various countries and continents, along with teaching them to identify the poles, hemispheres and equator. It is a simple method to educate children about India's neighbouring countries, its proximity with various countries and other important geographic facts. With the globe, teach children about sun patters, earth's rotations and revolutions and phases of the moon.